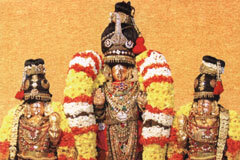 Masi Pooram in February-March and Panguni Uthiram in March April are the important festivals of the temple. On the last Friday of Panguni (March-April) or on the last Friday of Chithirai, Tirumanjanam is simultaneously performed for Lord Adikesava Perumal, Mother Yathiraja Valli, Sri Andal and Acharya Sri Ramanuja. Sriperumbudur is the Avathara Sthala (birth place) of the celebrated Vaishnavite Acharya who established the Vishishtadvaida philosophy. As a heaven by itself on earth giving birth to the great Acharya, there is no Sorgavasal in the temple as is traditionally seen in Lord Vishnu temples. On the Vaikunda Ekadasi day falling in December-January, both Lord and Acharya grace together in the Boodhakal Mandap. As a formality, only the belled doors of the shrine are opened on the occasion. The temple is open from 6.30 a.m. to 12.00 a.m. and from 4.00 p.m. to 8.30 p.m.
Sri Adikesava Perumal Temple, Sriperumbudur-602 105, Kancheepuram district. 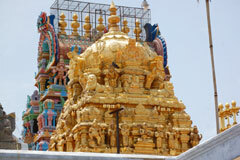 The Golden Mandap stands majestically in front of Sri Ramanuja shrine built by the Maharaja of Mysore. There are four Kalasas representing the four Vedas with Lord Paravasudeva Perumal, Sri Ranganahar under the Kalasas. Still below are Namperumal with Sridevi and Bhoodevi, Garuda the eagle vehicle of Lord Vishnu and Dwarapalakas. The mandap looks like a separate temple by itself within a temple. Those facing adverse aspects of Rahu and Ketu planets and those facing delays in marriage due to Kalasarpa dosha in whose horoscopes the snake planets are at both ends covering the other planets in between them, pray here for relief. Devotees perform abishek to Sri Ramanuja with milk as a prayer commitment. Sri Andal shall grace the devotees along with Lord from Aadi Pooram day falling in July-August to Avani Pooram day falling in August-September. She will be with the Lord during Margazhi month covering December-January. On these days virgins pray to Her for wedding boon with a good match. Sri Ramanuja was born in the year 1017 in Sriperumbudur to Kesava Somayaji and Gandhimathi couples. The elder uncle of the child Sri Tirumalai Nambi was serving in Tirupathi temple. As the child looked like Lakshmana the younger brother of Lord Rama, he named the Child Ilaya Azhwar. Ilaya means younger. 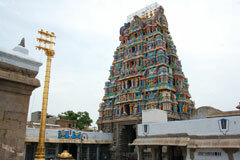 There is a mandap in front of the temple where Sri Ramanuja was born. During the 10 day Chithirai festival during April-May, Acharya graces from this mandap. On His birth star day, he is placed in a cradle as a child and fed with milk in a conch. During this festival, the Parivattam – a turban linen – is brought from 36 Vaishnava shrines-Divya Desas – as a courtesy to the Acharya. 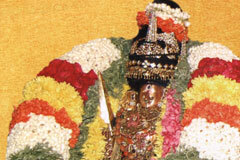 Sri Ramanuja is also praised in the name of Yathiraja. Yathi means an ascetic. Raja means leadership. Mother in the temple is named after this principle as Yathirajanadhavalli. She graces in the name of devotee expressing Her love for the child. Anujan means younger brother. As Ramanuja’s avtar is attributed to Sri Lakshmana the younger brother of Lord Rama, He was named Ramanuja – meaning the younger brother of Lord Rama. As Sri Lakshmana, Ramanuja represents the divine snake Adisesha, those afflicted by the adverse effects of the snake planets Rahu-Kethu and facing Kalasarpa effects delaying their marriage, worship here for relief. They spill the water of the Ananthasaras theertha on their head, perform milk abishek to Sri Ramanuja and light ghee lamps. There is not a day in the temple without a festive importance. 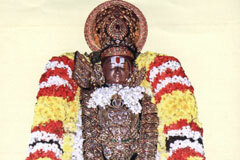 When there is no festival of importance, Perumal comes in procession in morning and night. A fragrant garland comes in procession with all music. It means that Lord Himself is coming in the form of a garland. From the day of Deepavali till the Hastha Star day in Thai month (January-February) abishek to Acharya is performed with hot water as this is winter season. He is also dressed with a coat, woolen and velvet upper cloth so that the winter should not affect Him. During summer, the Acharya will have abishek with sandalwood paste. 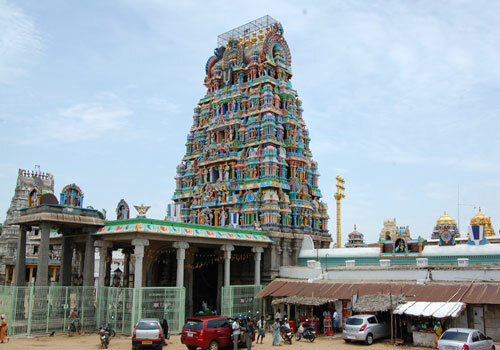 There are three Ramanuja idols, the first in Melkottai in Tirunarayanapuram in Karnataka, the second in Sri Rangam in Tiruchi and the third in this temple at Sriperumbudur. These are called Thanuganda Tirumeni – that which are liked by the Acharya. These idols were made by His disciples as suggested by Him. 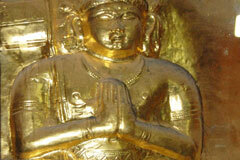 The Acharya embraced these idols and infused his power into them. Hence, these idols are known as Thanuganda Tirumeni. These idols were made when Sri Ramanuja was 120 years old. The ear, hip bones are so realistically sculpted resembling His age. White robe: A king wanted to take vengeance on Sri Ramanuja and planned to punish him. Knowing the king’s plans, a disciple, Koorathalwar, wearing the saffron went to the king. Sri Ramanuja escaped in white robes. The king blinded Koorathalwar for failing his plans. With a view to respect the disciple who lost his eyes for Him, Sri Ramanuja graces in white robes on one day during the Chithirai festival. Beloved son: A king took the idol at Tirunarayanapuram to <?xml:namespace prefix = st1 ns = "urn:schemas-microsoft-com:office:smarttags" />Delhi please his daughter. To recover the idol, Sri Ramanuja went to Delhi when the idol moved and sat on the lap of Acharya, whom he embraced saying Chella Pillai meaning beloved son. This incident is celebrated in the Acharya procession on Panguni Poosam festival. Relief from a sin committed unknowingly: A king ruling the Tohondai region (covering Chennai, Tiruvallur, Vellore, Cuddalore, Kancheepuram districts) Hareeda Maharajan by name saw a tiger to kill a cow. He applied his arrow on the tiger, yet the cow was killed by the beast. Thus, the king incurred the curse of cow. He came to this temple, worshipped the Lord and was relieved of a sin which he did not commit knowingly. There is a lizard sculpture behind Sri Ramanuja’s shrine. People worship this lizard for relief from sins. Acharya Sri Ramanuja lived a full circle of life spanning 120 years. (A full life means that a person should undergo the prescribed period of all the planets in his life that covers 120 years, not a day less.) Sri Ramanuja, in next His birth was born as Manavala Mamunigal who taught the meaning of commentaries on our scriptures. His idol is seen on a pillar in the temple. 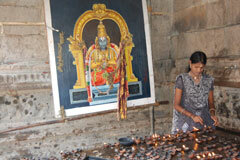 There is also a separate temple for Acharya Sri Manavala Mamunigal outside the temple. The Boodha Ganas – an army-like division of Lord Shiva’s empire – approached Lord Vishnu for relief from a curse spelt on them by Lord Shiva. Lord Vishnu created a spring here through a serpent named Ananha (Anantha Saras Theertham), gave darshan to the Bhoodas from its bank and relieved them of the curse. As a token of their gratitude, the Bhoodha Ganas erected this temple for Lord Vishnu. Hence, the place is called Bhoodhapuri. The Lord is named Adikesava Perumal. 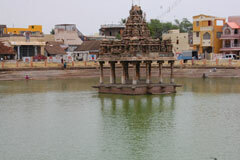 Sriperumbudur is 20 km from Tiruvallur. 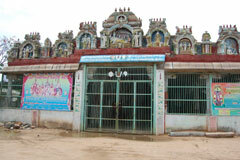 The temple is near the bus stand.